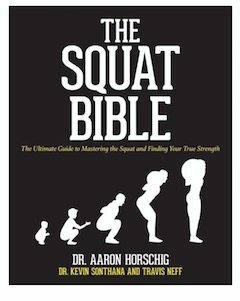 The Squat Bible, written by lead author Dr. Aaron Horschig is a must read for any coach, athlete, or fitness professional utilizing a squat variation in their programming. Regardless of years under a bar or coaching experience, the information in this book will give you both the reassurances that you are on the correct path and simple “nuggets” to help improve the technical efficiency of this popular movement. As some of you may know, I have been utilizing the 3 C’s concept to evaluate one’s exercise technique. These are Corrosive, Competent, and Competitive. Dr. Horschig speaks about movement competency early in his book and how we have allowed athletes to sacrifice efficient movement in order to perform. Let’s remember inefficient or corrosive technique increases risk of injury and decreases potential transfer to athletic traits. The book is simply written, very will organized, and a simple read. These are critical keys to me in my ability to comprehend the information presented and apply the information to my athletes. I really liked how each basic squat movement was broken down technically (Back, Front, Overhead), in particular, the slight differences between a bodyweight squat compared to a loaded squat. The key to this book in my opinion is the individual chapters of squatting based on a joint by joint approach. I was impressed by Dr. Horschig’s detailed analysis of each joint from foot to shoulder, its importance to an efficient squat and the corresponding correctives movements to help areas of inadequacies. This is something I must commit to doing a better job of being educated on. It’s funny that the number one point that has resonated with me as a coach and lifter from the book was very early on when Dr. Horschig wrote about the “Tripod Foot”. Most of us have discussed the importance of the foot being grounded into the floor while squatting, but the three points of contact emphasis was a genius point to me. Maybe this is a term I just missed out on and I am behind the times, but I don’t care, I love that one. To wrap it up this book is well worth the investment. I promise you will learn something too help improve this giant of strength exercises.